Like Samuel Johnson, I find myself constantly returning to Lichfield, and staying in a variety of places. For Dr Johnson, they were return visits to the place he had born; for me, they are return visits to the place that nurtured me spiritually in my late teens and shaped and formed by spirituality and my Anglicanism. Like Samuel Johnson, I find myself staying in a variety of places, and last week I stayed in the Hedgehog Vintage Inn on the northern fringes of Lichfield, in a semi-rural setting on the corner of Stafford Road and Cross in Hand Lane. 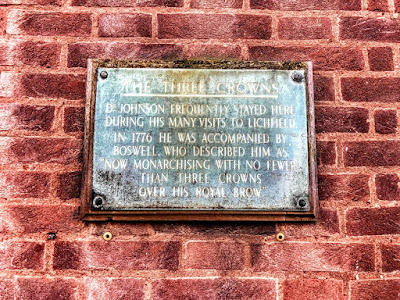 One of the places where Samuel Johnson (1709-1784) often stayed on his return visits is the former Three Crown Inns, one of Lichfield’s lost pubs, which once stood at 7-9 Breadmarket Street, next door to the birthplace of the man who is, perhaps, Lichfield’s greatest literary figures. 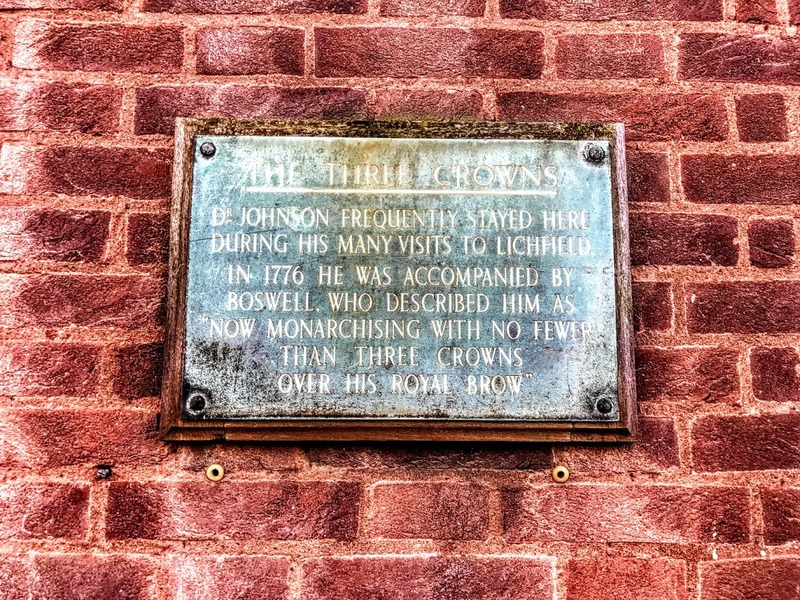 Dr Johnson frequently stayed here during his many visits to Lichfield. In 1776 he was accompanied by Boswell, who described him as ‘now monarchising with no fewer than three crowns over his royal brow’. This three-storey Georgian building dates from the early 18th century, although there are many later alterations. Indeed, there may have been an earlier inn on this site, as the name Three Crowns refers not to the papal tiara but to the three crowns of England, Ireland and Scotland which were brought together in the early 17th century when James VI of Scotland was crowned James I in 1603. The Three Crowns appears on Snape’s map of Lichfield in 1781, three years before Samuel Johnson died. The earliest known masonic lodge in Lichfield was formed around the corner at the Scales Inn in Market Street on 10 March 1784 and it became a ‘Moderns Lodge’ when it was constituted as Lodge of Unity on 24 July 1787 at the Three Crowns Inn on Breadmarket Street. The lodge had closed by 1811. 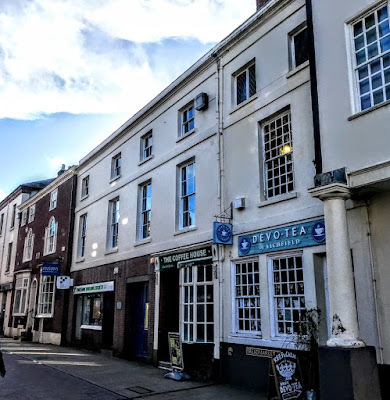 Meanwhile, the Three Crowns continued to be run by members of the Cato family for almost 80 years: by Joseph Cato from 1793 to 1834, and by his son John Joseph Cato from 1834 to 1859. This has been a Grade II listed building since 1952. The notable features include the central carriageway, the paired doors, and the 20th century shop front in traditional style. The last landlord was probably John Barber, and the Three Crowns closed for the last time in the 1960s. 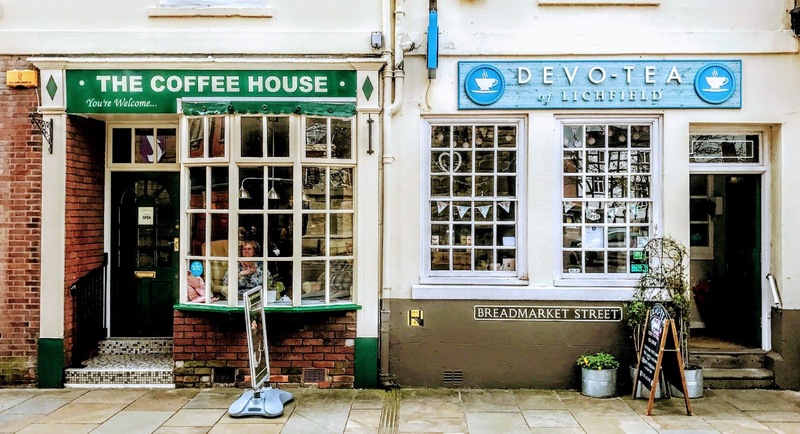 The former inn is now divided into shops and offices, including a branch of the Yorkshire Building Society and the Coffee House – until recently a shopfront for the Lichfield Mercury – and Devote-Tea. 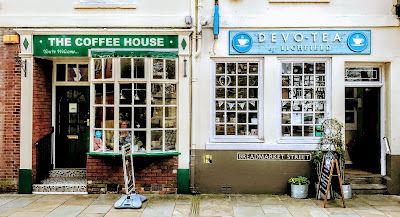 A coffee shop and a tea shop, in their own ways, I suppose, continue the hospitality traditions of the original Three Crowns, and Samuel Johnson, of all people, knew the importance of a coffee shop.